Langille's: mechanical contractor - 1st LEED Platinum Certification for Green Homebuilding, Eastern Canada! Ductless mini split heat pumps - ideal with electric baseboard heating! Langille's is committed to designing energy efficient heating systems without sacrificing home comfort. We specialize in customizing a heating system to work with your family's lifestyle. Mary Comeau and Paul Langille check over tomorrow's line-up. Ductless mini-split heat pumps maximize comfort by reducing temperature fluctuations and, at the same time, saves an estimated 40% or more on energy consumption. Ideal for home or businesses with electric baseboard heating. Delivers 4KW worth of electrical heat for the 1KW purchased. No ductwork required - easily retrofits into homes with hot water heating - burn less oil. No need to remove your existing heating system. Simply add ductless splits to the rooms most often used. Easily installed in renos or where it's difficult to install a traditional heating system. Quick and clean install - most can be completed in less than a day. Bonus! Air conditioning for warmer season and dehumidification for daytime comfort and night time sleep. Whatever your heating need is - service, annual maintenance, retrofit or a complete heating system, Langille's Plumbing & Heating's team of professionals will provide you with the right solution! Replacing your outdated boiler with a new model and high efficiency burner is only part of the solution. At Langille's we deliver complete system efficiency from recommending the proper insulation under in-floor heating to reducing energy costs by installing a control system. Langille's is proud to be the mechanical contractor for the first LEED Platinum Certification for Green Homebuilding in Atlantic Canada. A geothermal heat pump or ground source heat pump (GSHP) is a central heating and/or cooling system that pumps heat to, or from, the ground. It uses heat originating from deep in the Earth's mantle as a heat source in the winter or a heat sink in the summer. Geothermal heating systems work in a unique way - there are no chemicals or side effects, yet, they are powerful enough to heat - or cool - an entire building without furnaces or boilers. Switch to a geothermal heating system and save significantly on energy costs. Although all homes differ in energy needs, there is the ability to save up to 50% or more on the typical energy bill when geothermal heating systems are used in place of the standard units or up to 70% less electricity than other electric heating and cooling systems. Not only do these systems reduce heating and cooling costs, they are a clean, natural and renewable energy source - good for everyone and the Earth. Heating your home with a forced air system is a thing of the past. The benefits and comfort of a radiant floor heating system are endless - creating energy savings and a healthier home for you and your family for years to come. In-floor heating systems heat every room in your home evenly with heating pipes placed under the floor before installation. Guy's Frenchys in Bridgewater, Nova Scotia called on Langille's Plumbing & Heating to install radiant infloor heating - the job required 10,000 feet of piping. The heat source in hydronic radiant floor heating is usually a boiler or a hot water heater, but other heat sources can be used as well. Unlike conventional forced-air furnaces, radiant floor heating has no ducts or radiators to contribute to dust collection or movement. 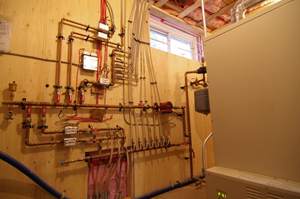 Langille's Plumbing & Heating Limited has been installing reliable hydronic heating systems for decades. The traditional large, noisy boiler is long gone. The newer low capacity boilers use less energy because they are required to maintain the temperature of less water. Electric boilers are an alternative to oil-fired units. Coupled with high tech control system and staged elements that maintain steady even heat using only the elements necessary to satisfy the demand, they are an excellent choice. 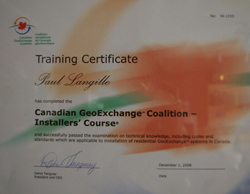 You can trust Langille's service technicians to maintain your heating system to operate efficiently and reliably. We offer 24 hour emergency service. Wouldn't it be great to save 40 percent or more on heating bills without sacrificing comfort? Watch this 3 minute video from Steffes to learn how. Langille's Plumbing and Heating is proud to partner with Steffes Corporation and Nova Scotia Power to offer "Time of Day Usage" Heating Systems. Electric Thermal Storage (ETS) is the technology of converting and storing off-peak, low cost electricity for satisfying a home's comfort requirements 24 hours a day. The system contains electric heating elements which lie within high density ceramic bricks. The bricks are capable of storing large amounts of heat for extended periods. Electricity is more expensive during high-demand times of the day. 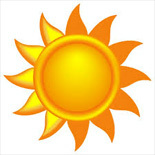 Off-peak hours are the times of day or night when power companies usually have excess energy supply due to low demand. Nova Scotia Power offers reduced rates on electricity consumed during off-peak times. These rates are called "off-peak rates." During a power company's off-peak hours, the elements generate heat that will be stored in the bricks of the ETS Heating Systems. This stored heat is used to satisfy immediate heating requirements and to provide total comfort during peak hours. Steffes ETS Heating Systems are a green heating solution that benefits consumers, power companies and our environment. Active solar heating systems, which can easily be retrofit into a home, rely on solar collectors, usually placed on the roof of a home, to gather the sun's energy. The EOS Solar Collector system can meet 80-to-100% of a household's annual domestic hot water demand.